I am SO excited to share these two recipes with you!! Lately some of my favorite meals are traditionally unhealthy dishes that I’ve found a healthier version for. Chris does not like to be surprised (scarred by a young Chocolate Zucchini Bread incident), so I’m not allowed to call Cauliflower Tots, Tater Tots, because “that’s not what they are”. 🙂 As long as I’m honest upfront, he’s game for (almost) anything. 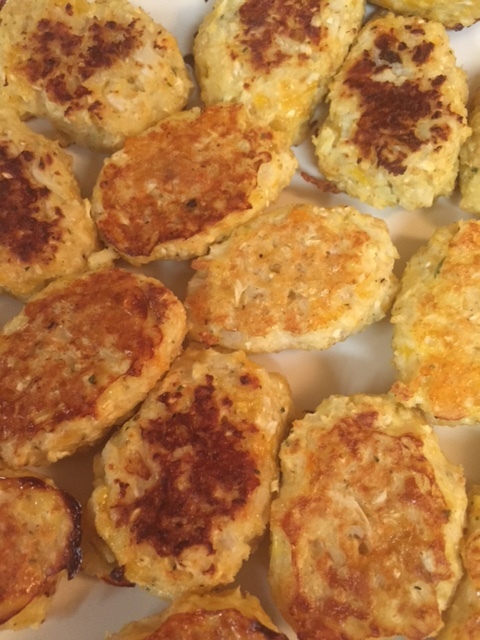 So, speaking of Cauli Tots, you’ll find the link to the recipe here. I am addicted. I have no idea how she made them look perfect, though. But anyways, these are WAY better than tater tots, no doubt. They do take a little while to prepare and are a little messy, but completely worth it. 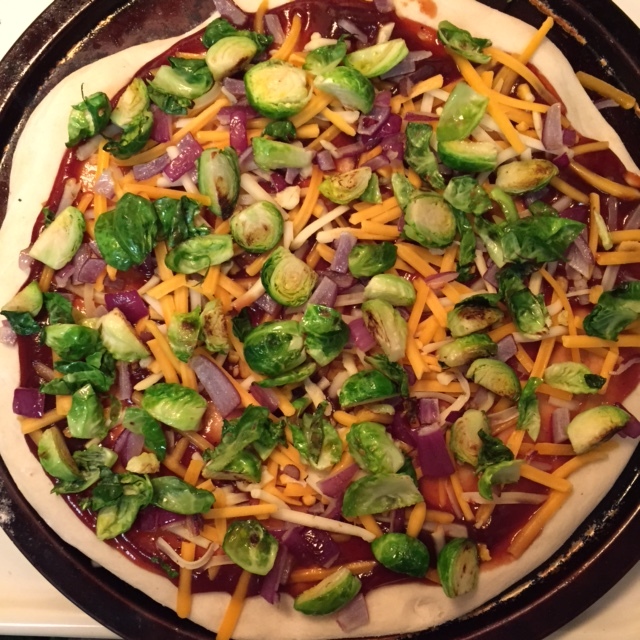 To go with the cauli tots, I found this Brussel Sprout Pizza on a blog I follow. The blog is called A Beautiful Mess– it’s a really awesome blog of crafts, home improvements, fashion, food, etc. It’s awesome & you should follow it too! Anyway… we’ve made this multiple times in the last couple months. 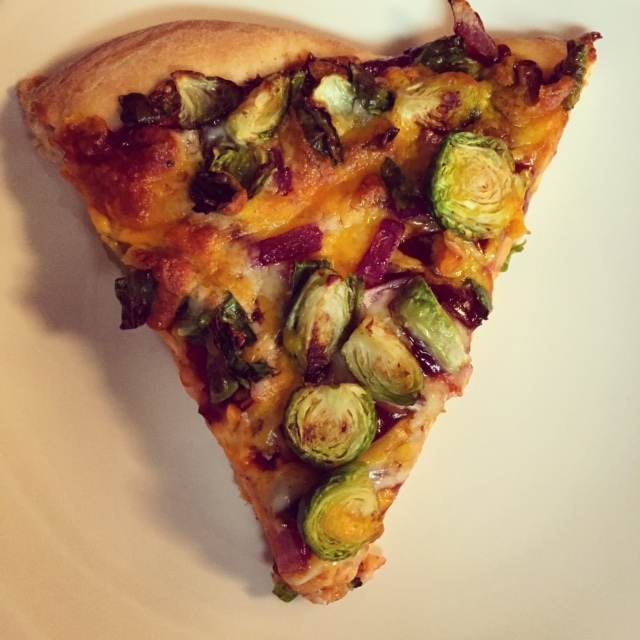 Maybe once a week…I’m not even ashamed, because I LOVE brussel sprouts. And pizza. And BBQ sauce. Sooooo, it’s basically perfect. We follow the instructions completely on this recipe. It’s the best pizza dough I’ve ever made, and I always freeze half for the following week. 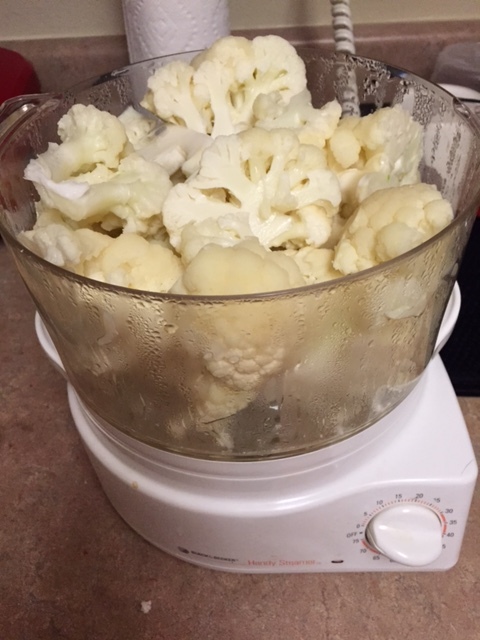 We don’t use a whole lot of cheese as you can see below, because I’m all about the veggies. I don’t usually just like a couple toppings on my pizza- I love variety. Give me veggie lovers over pepperoni any day. But this, with only a couple ingredients, is amazing as is. Anyone else out there have a serious addiction to brussel sprouts? I don’t know why they were labeled the “gross” vegetable for children. I wish I had discovered them before I was 27!